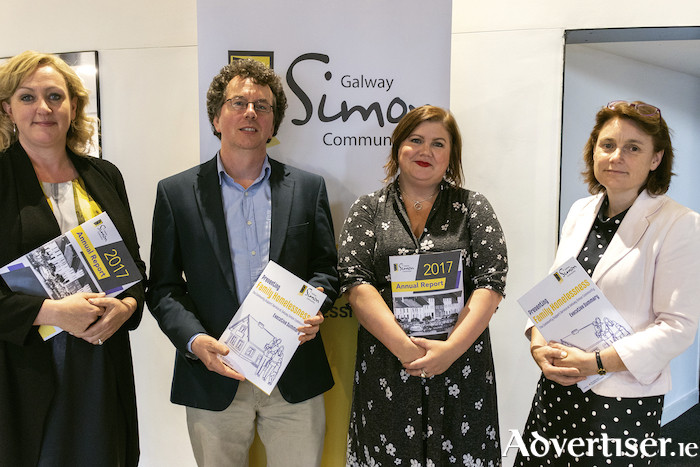 Pictured at the launch are Joan Reinhardt, Galway Simon, Dr. Pádraig Mac Neela, NUIG, Niamh Randall, Simon Communities of Ireland, Karen Golden, CEO of Galway Simon Community. The homelessness crisis in Galway is going to get worse before it gets better, according to local charity Galway Simon Community who launched their 2017 Annual Report this week. At their launch event, the charity took a look over the homelessness and housing crisis over last year, a year they say was the most challenging year since they began providing services nearly 40 years ago. They also discussed the role of homelessness prevention at this critical time in Galway and why their focus has shifted to this. Speakers at the event included Karen Golden, CEO of Galway Simon Community, Dr Pádraig MacNeela, Psychology Lecturer at NUI Galway, Niamh Randall, Head of Policy and Communications at the Simon Communities of Ireland and Joan Reinhardt, Services Manager of Galway Simon’s Women and Family and Youth Service. Speaking at the event, Karen Golden, CEO of Galway Simon Community, noted the increasing number of people in emergency accommodation, from 36 to 499 individuals and families, over the last five years and highlighted the pressures on their services at the same time. “Every year for the last number of years, the crisis in Galway has continued to worsen. Despite all of the measures that have been taken to date, there are more people in emergency accommodation now and Galway Simon have never supported as many people. "Social housing in Galway is not coming on stream fast enough for the demand from the local community. The Minister set social housing targets for Galway City and County of 931 units for 2018, with 73% of those to come from the private rental sector. However the reality is that 93% of the units delivered so far this year, according to the Department, are coming from the private rental sector. With rent increases in the city of 15.9% in the last year, this is not sustainable,” added Ms Golden. The charity supported 537 unique households in Galway last year and explained that the majority of these, 402 unique households, were supported to prevent them from becoming homeless. The CEO went on to explain why the focus on homelessness prevention is so important at this time. “Without the supply of social and affordable housing available that is needed for city and county, the harsh reality is that the crisis is going to get worse before it gets better. That is why at this critical time, Galway Simon Community are placing our focus on homelessness prevention; keeping people in the homes that they already have. "It is our belief that early intervention is the key to keeping people out of the emergency accommodation and ultimately, out of homelessness. If we can prevent more people from becoming homeless in the first place, we can in turn reduce the economic cost and trauma associated with homelessness,” said Karen. “Our plans in the near future involve the extension of our Homelessness Prevention Services, Youth Service and Health and Well-being Team, and acquiring additional housing so that we can prevent more individuals and families from becoming homeless,” she concluded.